Do you want to be able to grow vegetables, herbs, and even flowers in the middle of winter? Since the cold weather and the snow usually make it impossible for you to grow something in your garden, you can always go around that and still be able to enjoy fresh vegetables that you grow yourself in the cold season. The way to do that is by planting the desired vegetables in a greenhouse. 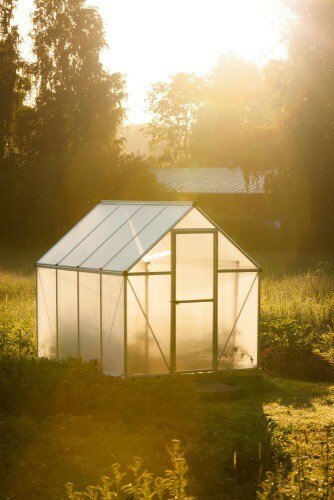 You don’t even need a lot of space in your garden, since there are smaller greenhouses that you can use as well. If you’re good with DIYs, take a look at these 8 greenhouse plans for cold climates that might inspire you to build your own. If you’re looking for inexpensive greenhouse plans, then you’re definitely going to enjoy this one. 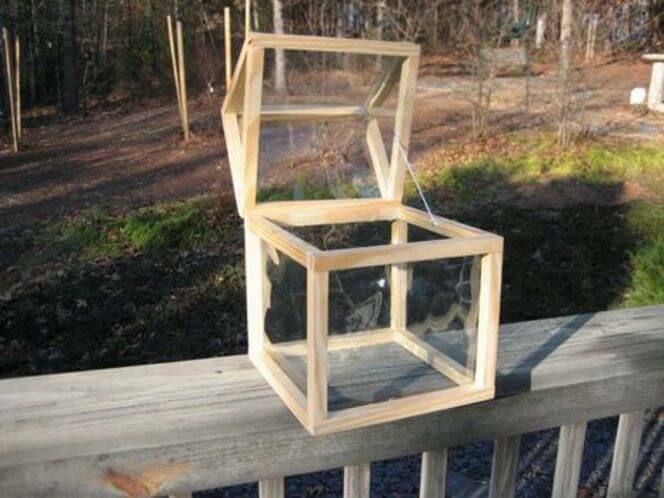 You can build your own greenhouse for only $50. If this sounds too good to be true, bear with us while we explain how you can make this design come true. The trick is to recycle many things and learn to repurpose items that you have no other use for. 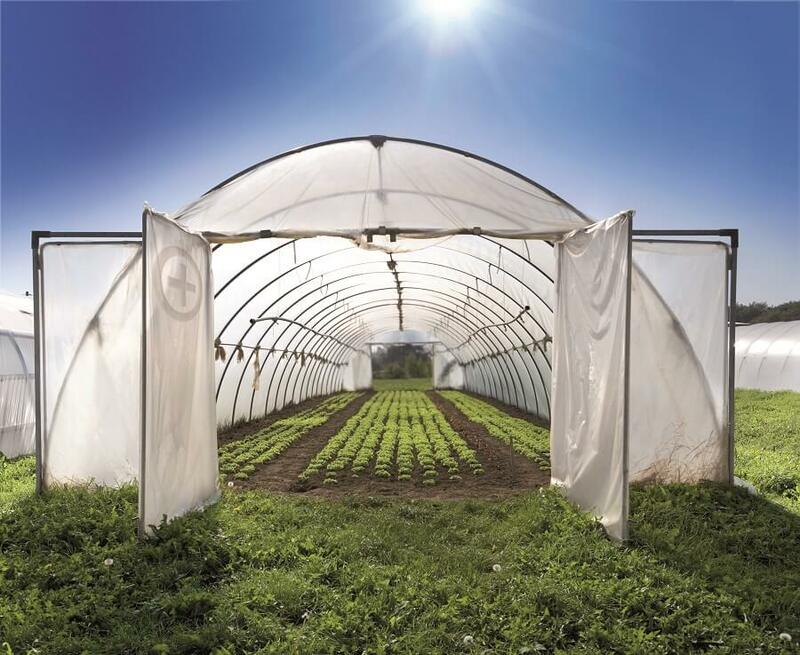 The greenhouse is covered in plastic sheeting, which is known for being one of the cheapest cover options when it comes to greenhouse plans. 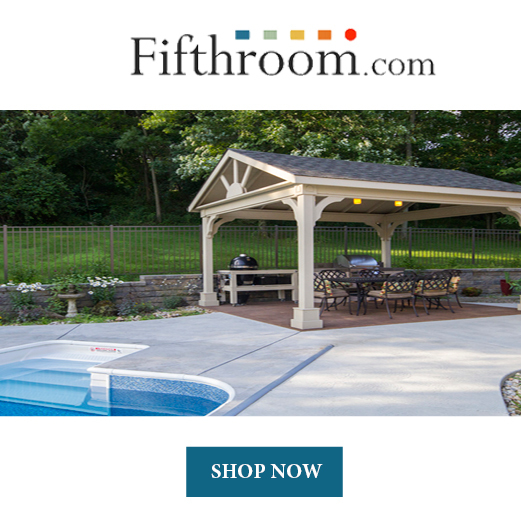 You can find all the steps you have to go through on The Door Garden website, and how to get your hands on the supplies as well. 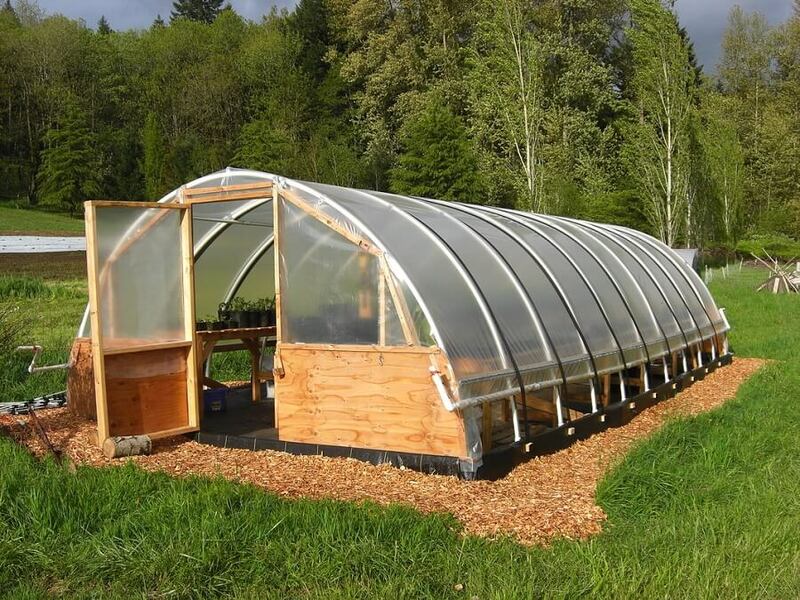 The creators of this ingenious greenhouse also inform you that even if you were to buy the supplies instead of recycling them, the whole project would still be quite cheap, more precisely around $200. 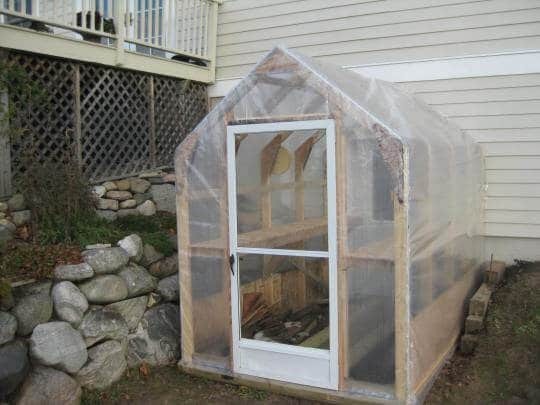 This is probably one of the most innovative homemade greenhouse ideas we ever stumbled upon. It’s perfect for people who own a basement. The idea is that you can build a greenhouse around the basement door. That way, you can walk straight from the house into the greenhouse. This is an especially useful trick in the wintertime, when you don’t really want to go outside in order to tend to your plants. Since you’re going to want to avoid planting things straight into the ground, because they’ll block your basement door, you can use pots or create some shelves that you stack on top of each other. Of course, this also depends on the size of the greenhouse. If you can afford to build a larger one, there’s no need for you to stack the shelves. If you want to build this greenhouse for yourself, access Tom’s Garden. You’ll find all the instructions you need there. Don’t let the name of this greenhouse fool you – you can also use it to protect vegetables, herbs, or any other kind of plant you want to grow in your garden. 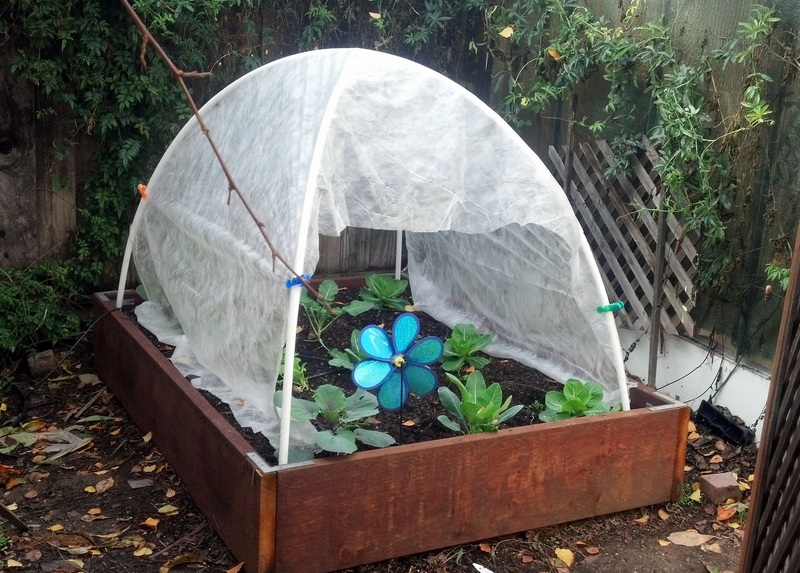 The idea behind this greenhouse is to preserve your raised garden beds in the cold season. We must say, in terms of greenhouse plans, this one is definitely one of the cheapest and easiest ones to put into practice. All you have to do is use two PVC pipes and create a frame shaped like a hoop. Then, cover it with plastic sheeting and use chip bag clips to make sure it’s clipped on tight and won’t blow away. 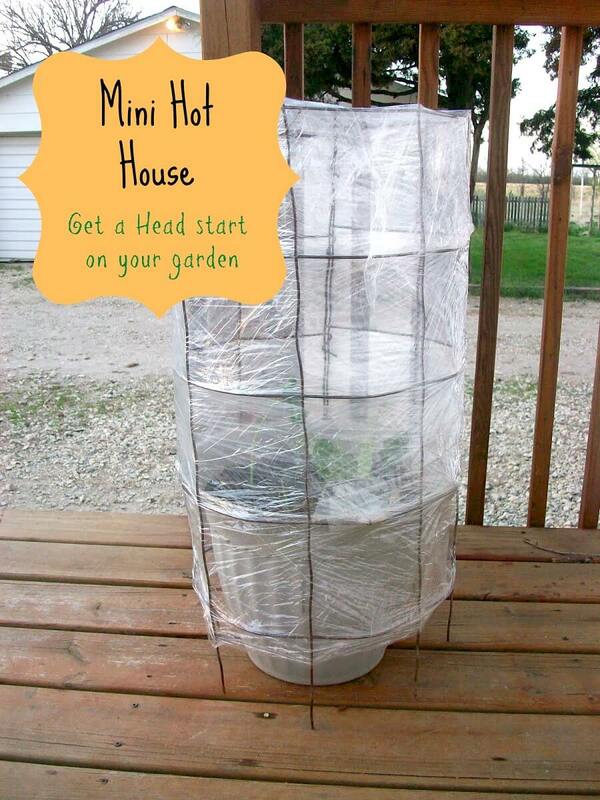 One of the greatest things about this miniature greenhouse is that you can make it as large as you want. Plus, you can also adjust its dimensions in no time. Here are all the steps you have to go through to build it. Speaking of miniature greenhouse plans, we couldn’t help but include another one. This one too can be adjusted according to your needs. Remember that it’s not suitable to use as a replacement for a real greenhouse. Still, sometimes you need a fast and easy solution to protect your plants from the cold. Let’s say the weather unexpectedly turns bad and you don’t have time to build a proper greenhouse. What do you do then? Well, you can try to shelter your plants by creating some mini hot houses. The process is extremely simple and it doesn’t take a long time to complete. If you have plants in pots, you can take a tomato cage and place the pot inside of it. What protects the plant from the cold is a piece of plastic wrap that you use to surround the cage multiple times, according to how hot you want it to be inside. Both tomato cages and plastic wraps are not expensive at all, so you’ll be working on a budget as well. Be sure to check out more relevant information about this project by accessing the Homesteading Wife blog. For people who want to build a proper greenhouse in their garden or backyard, but still want to save some money on materials, there’s always the option of a bamboo greenhouse. Why is this cheaper, you ask? Well, because you can actually grow bamboo instead of purchasing it from the store. That way, you’re going to get most of the materials you need without paying a dime. This option too uses plastic sheets to cover the greenhouse, which is cheap yet very effective. Plastic sheets trap the heat inside of the greenhouse. Thus, they provide your plants with a constant temperature that supports their growth and development. Out of all the greenhouse design ideas we’ve discussed up until now, this one might require a bit more time and patience to get done. Still, it’s not something you’ll have to put a lot of effort into. You can find all of the instructions on the Premeditated Leftovers website. If you want to be able to grow herbs or small flowers in winter, then you should take a look at this tiny yet effective greenhouse. Of course, you can make it as large as you want. Still, one of its main benefits should be its size. The smaller it is, the easier you can move it around and store it away when spring arrives. 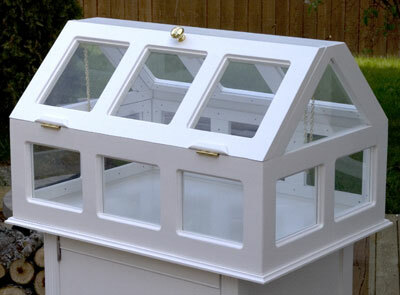 What you need to do in order to make one of these countertop greenhouses for yourself is create a box made of wooden frames. Even if you could use plastic sheeting for this DIY as well, we recommend you to try glass panels. 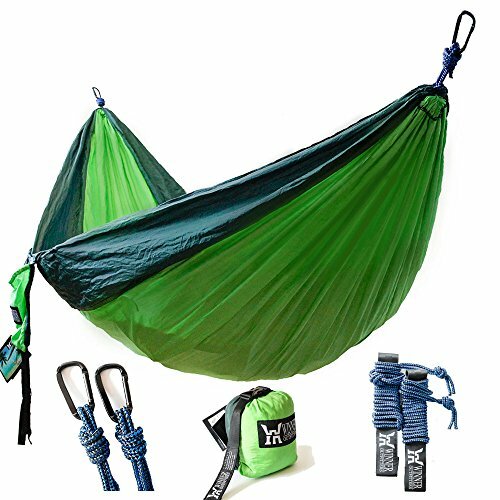 Since the structure is not large, you won’t spend a lot of money on them. 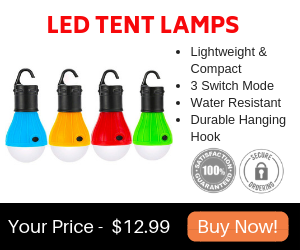 Plus, they’ll provide your plants with a lot of light. The amazing thing about this small greenhouse is the fact that even if the sun can shine through the glass, the temperature inside remains constant no matter what. For all of the materials you need and the steps you have to go through to build it, access the Instructables website. Do you have plenty of space in your garden and want to find some large greenhouse plans to inspire you to build your own? Then this option might be just right for you. The instructions you can find on Fiddlehead Farm give you two great options. The first one is perfect if you can afford to invest more money into this project. It involves a stainless steel hoop kit and it’s the more reliable option. Still, that doesn’t mean that you can’t choose the second option as well. This one involves PVC pipes and a wooden frame. Both options actually use plastic sheets as a cover. So you’re at least going to save some money on that. In order to make your greenhouse even more reliable, you can lay some mesh fabric on the floor and bring some tables in to serve as plant supports. This greenhouse is called “sort of” a greenhouse because the people who created it, namely those behind Runner Duck, were unsure of whether the end result was a proper greenhouse or more like an atrium. 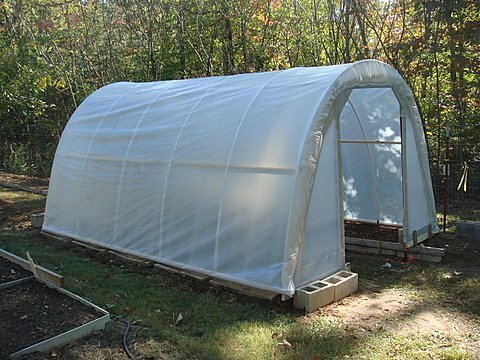 Regardless of how you want to call it, there’s no denying that this structure serves the same purpose as a greenhouse – it protects your plants from the cold. The aforementioned website doesn’t provide you with the exact instructions to recreate this specific greenhouse. However, it does give you a lot of cool and interesting ideas that can help you make this greenhouse your own and adapt it according to your needs. Basically, you’re going to need some planks and some glass panels, plus a really awesome pull down door. Just keep in mind that this will only work if you want to grow just a couple of plants. If you’re looking for some tips on how to build a greenhouse, plus a couple of more awesome greenhouse plans, we discussed this topic in a previous article that you should definitely check out! It’s got lots of helpful information and tips on different greenhouse plans, designs and ideas. Other than that, we hope today’s guide has managed to inspire you to build your own greenhouse and be able to bask in the joy of tending to plants even in the cold season.